Housing Law is one of the most important areas of law that our civil department provides assistance in. We understand the fear that accompanies legal proceedings that put the security of your home under threat or not knowing what your rights are as a tenant. One of the most common issues is being at risk of losing your home because your landlord has started possession proceedings or applied for a warrant to evict you from your home. Our aim is therefore to provide you with detailed advice about the situation and help through the court proceedings.We appreciate the stress caused to your daily life if you are facing homelessness and have a family you are responsible for housing, in which case advice about where you stand legally and if and how far the council has a duty to help you by either providing your with emergency accommodation or putting you on the housing register to bid for properties. We are also able to help if your accommodation is not suitable for your needs and you need to move but no-one seems to understand just how bad things have become for your family in your home. One of the most common problems and greatest causes of stress is suffering nuisance or harassment from neighbours or disputes arising out of cross-allegations of anti-social behaviour between neighbours, we can help in pursuing actions against nuisance neighbours or advise you on your rights and the possibility of obtaining Injunctions to prevent nuisance neighbours from continuing with their behaviour. Mediation is also extremely helpful to try to repair a deteriorating relationship with a neighbour and as such prevent a minor misunderstanding from escalating into full-blown, expensive and time consuming litigation. Disrepair is also a problem that leads to numerous enquiries by tenants. If you are living in unpleasant conditions or your landlord is failing to carry out repairs to your home as he/she is obligated to under housing law this can be extremely upsetting and stressful. Our job is to get your landlord to take the specific action of carrying out the repairs as required in law and depending on the severity of the problem or how long you have been living with it; you could be entitled to receive damages which we would seek to do on your behalf. Clarke Kiernan Solicitors prides itself on being one of the few firms in Kent that has a legal aid franchise with the Legal Aid Agency to provide advice and assistance to tenants with housing problems. We will assess all clients with possible cases for eligibility for public funding. We are committed to providing a high quality, efficient and caring service to all our clients during this difficult time. 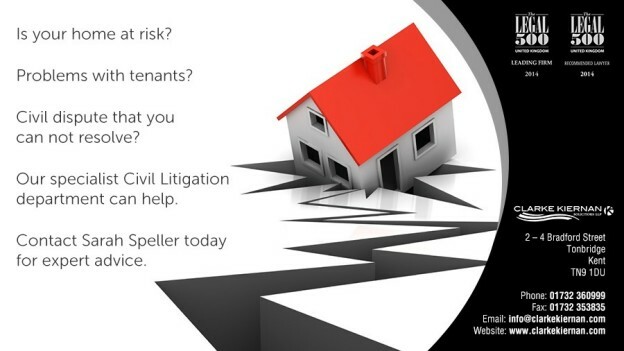 Should you require assistance in this department please contact Sarah Speller on 01732 360999 or e-mail an enquiry to civil@clarkekiernan.com. We will assess you for eligibility for Legal Aid and also provide you with funding options prior to your meeting with us.